If there was a way to log TV time, my charts would say that I watch 90% Food Network and Cooking Channel shows. I am kind of addicted to watching shows that are mostly stuff I will not eat. However the shows I watch give me inspiration to cook my own versions of what I see. One cook/TV host that comes through each time with ideas for our meals is Guy Fieri.Whether he is at a 'funky joint' or cooking at home I am drawn to his food. Often when I need a meal idea I ask myself What Would Guy Fieri Eat? In Guy's latest book he has a chapter dedicated to pork and in previous books he has had a lot of pork recipes and even a disturbing photo of dead pigs...Bacon seems to be the hold-strong trend lately so I thought my first WWFE would be something bacon related. I created a tofu bacon slab salad. I know that tempeh is the go to protein source for vegan bacon fun but I wanted to create a thicker cut and I am a tofu gal! I took strips of super firm high protein tofu and marinated them in liquid smoke (which he explained in a show he used to not use because he thought it was cheating or something), maple/agave syrup, cayenne powder, garlic, Himalayan pink salt and pepper. After about 30 minutes, I heated up some oil in a frying pan, fried each slab till it was brown. 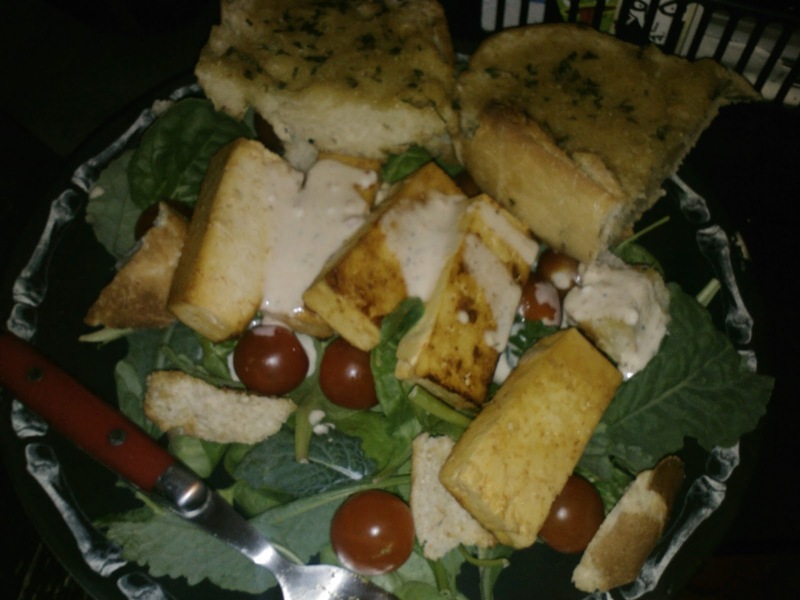 The salad was organic greens, organic cherry tomatoes, rustic seasoned croutons, tofu-bacon slabs with my habanero ranch dressing on top (Guy is a fan of hot sauce). I added a side of cheezey garlic bread and it was all good! Maybe it is still to healthy to appear on a dive menu but the pigs will thank ya - not to mention your heart! I am like you in that I watch a number of cook shows, not that I would cook from them, but I do gain inspiration from them and wonder how I can make that meail veg friendly. I like Guy, but I have never ever seen any of his cookbooks for sale at any of the U.K outlets, not even at my library :( shame as I'd like to flick through the pages. I dig liquid smoke. That my friend is a perfect tofu marinade you whipped up.